A pair of good sheepskin slippers is invaluable in the frigid winter months. Noted for retaining heat and being super soft, sheepskin is a natural fabric that is durable and comfortable. These slippers may sound perfect, but they’re not impermeable to dirt. When it’s time to clean your cozy pair, do so carefully to keep the fabric intact. Fill a sink or tub with lukewarm water. Add wool or sheepskin shampoo that contains tea tree oil. Refer to the bottle of shampoo for specific mixing instructions, as the amounts may vary among manufacturers. Avoid using commercial laundry detergents that are designed specifically for wool. These products often contain chemicals that are harmful to sheepskin. Put the slippers into the water so they’re completely submerged. Allow them to soak in the water for 10 minutes. Drain the water from the sink or tub. Rinse the slippers under clean, cool water until all of the soap solution is removed from the fabric. Place the slippers on a clean white towel. Blot the slippers with the towel to remove excess water. Stuff paper towels into the inside of each slipper. Allow the slippers to air-dry completely away from direct heat or sunlight. Never use hot water when cleaning sheepskin. It can damage and deteriorate the fabric. 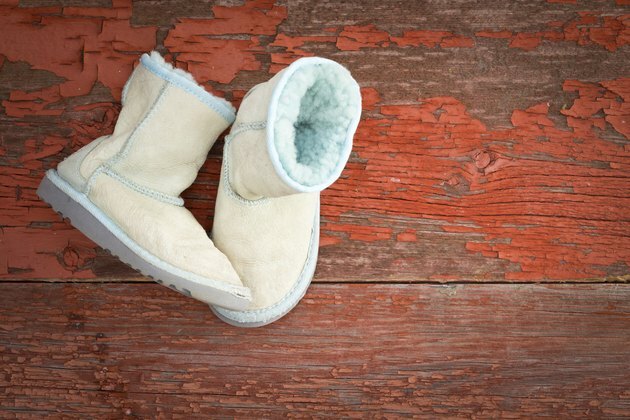 Avoid washing sheepskin slippers in the washing machine, even if the material itself is machine-washable. The agitation from the washing machine can damage the slippers and cause them to lose their shape.